I have been searching high and low for safe, natural, and organic products that I can use on my babies. It is hard to find high-quality chemical-free bug spray and sunscreen, especially. We are so happy that we found BALM! Baby and their wonderful made-in-the-USA products! I hope you enjoy this BALM! 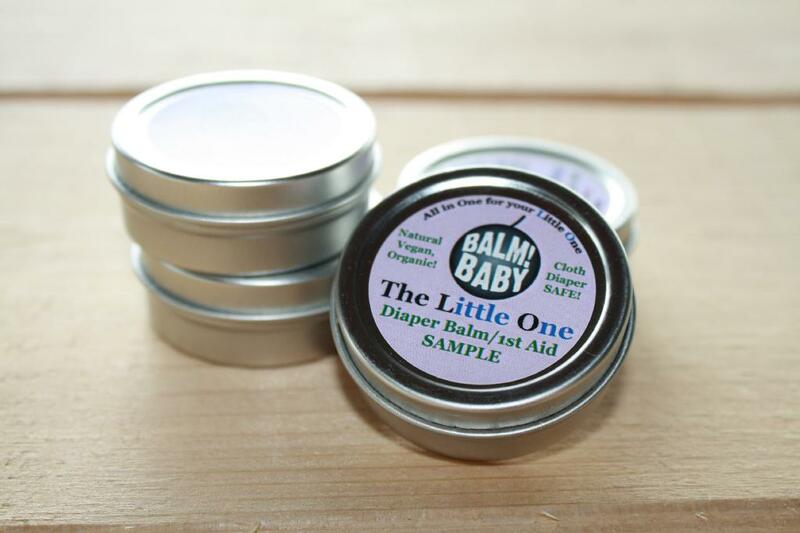 Baby Review and that you also stop by our giveaway for a BALM! Baby Travel Kit and Bottom Spray! BALM! Baby THE Little One - 1/2oz. & SUN Natural Sunscreen! - 2oz. First of all, it is always a treat to find a cloth diaper safe rash cream that actually works! "BALM! Baby THE Little One" is a green salve in a recycled tiny tub. It's perfect for the diaper bag or extra changing station. It was soothing for rashes and cleared up the dreaded red bum that sometimes occurs from overnight cloth diapers. We are almost out of it, we have used it so often! Next, the hand sanitizer is my one of my favorite products in this kit! It does not smell like other alcohol-ey sanitizers out there. While the smell comes on strong at first, it fades quickly and doesn't smell at all. My hands really do feel silky and smooth--not dry--after using the vegan BALM! Hand Sanitizer! I know this may sound trivial, but it's very important to me: when I eat after using the hand sanitizer, I cannot taste the hand sanitizer on my hands! This actually comes up a lot for us when we're out and about. A diaper change happens, I sanitize, and suddenly Little J. wants a peach. With normal hand sanitizers, any foods that I touch taste bitter and pretty vile. But not with the BALM! Sanitizer! I taste no difference at all! We used the SHUE BUG spray while out and about at a nature marsh and no bugs dared come near us! Take that! 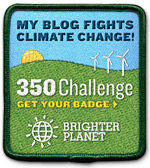 My kids and I were bite-free! The Bug spray also smells good and did not leave a film. We also used the bug spray while playing tennis during dusk. My husband, Baby E., and I all used the spray. Unfortunately I did get bitten at that time, although it was mostly through my pants. (I had only sprayed on exposed skin.) My husband and toddler did not get bitten at all. I feel very strongly about using Bug Sprays with ingredients that are safe for kids, which I why I love that the BALM! SHUE Bug spray contains only natural, organic ingredients such as witch hazel, chamomile, calendula, olive oil, coconut oil, neem oil, peppermint oil, eucalyptus, citronella, orange and vitamin e. I plan to continue using the SHUE BUG spray on my family because it is safe and has been effective for them. 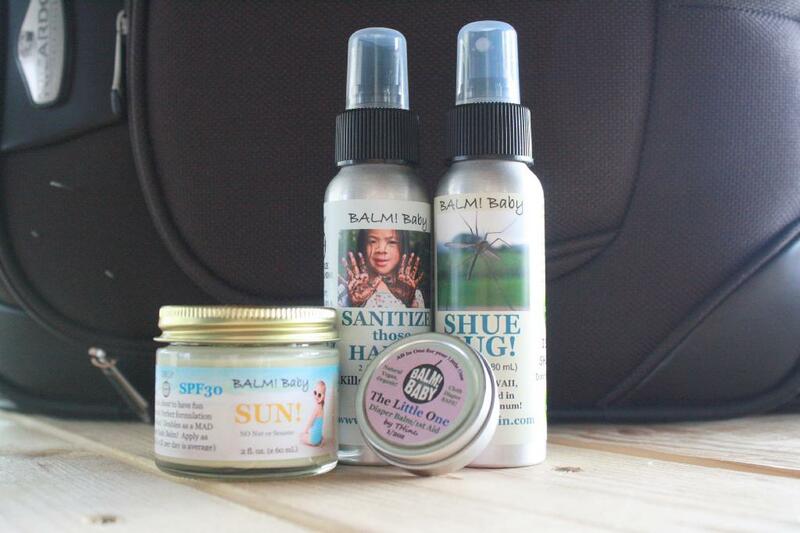 The Natural Sunscreen from BALM! Baby is such a relief to have around! With all of the scary research out there on what's in other sunscreens and lotions, I knew that I needed to find a natural alternative for my kids and my family. This SPF 30 sunscreen is meant to protect-and naturally, too! Luckily for me, Baby E. loves sunscreen, so she was happy to help me test out the sunscreen at the park. This natural and vegan sunscreen contains Zinc Oxide, so it creates a physical barrier on the skin as well as an absorbed barrier. It was slightly white on the skin, but rubbed in nicely and did not leave streaks or clumps. It smelled good and worked to keep our skin damage free! We returned home without any burns or spots! You can also use this sunscreen for diaper rash--just make sure to use a liner with cloth diapers for this one. I love that this sunscreen comes in a glass tub, so that it will be spill and squeeze-free in our diaper bag. We take it everywhere with us now so that we always have our sun-protection on the go! Overall, I am so pleased with all of the thought and care that BALM! Baby has put into their products! I would absolutely recommend this travel kit (and its individual components, especially the rash cream and hand sanitizer) to parents who care about what goes on their baby's skin. The ingredients in these products are all-natural, organic, vegan, and are not tested on animals. I love that the products come in glass or recycled aluminum containers as well! You can also choose to receive your products in recycled packaging or plastic-free packaging! If you have any allergies, BALM! Baby can accommodate your needs! Just let them know and they can customize their products for you!